Medium Waist / Hip 28" - 32" X-Large Waist / Hip 39" - 43"
AllegroMedical.com offers The Comfort627 Spinal Orthosis. The Comfort 627TM deploys unique opposing force technology to accelerate healing in the lumbar spine. Patients often experience pain relief from the compression and postural improvement that the Comfort 627 provides. How Does the Comfort 627TM Work? When the straps are pulled properly (outward and upward at a 45 degree angle), the straps work simultaneously to lift and compress the patients' anterior weight. The result is a distinct postural improvement and often a significant improvement in pain symptoms. 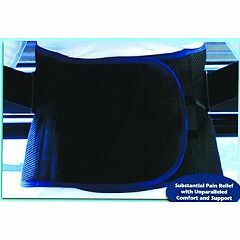 The interior rigid posterior panel is fabric covered and comfortably stabilizes the lumbar sacral region. Measure around the waist at navel. C627002 - Medium Waist / Hip 28" - 32"
C627004 - X-Large Waist / Hip 39" - 43"